Forget Ace Ventura Pet Detective – Meet the Dog who Searches for Lost Pets! We all see headlines about dogs winning awards or doing unbelievable things, but have you ever wondered about their backstory? Where they come from, and how they become a hero dog? Well, I’m going to tell you Glory the Bloodhound’s story. It's the story of an eight week old Bloodhound puppy who grew into a one hundred and thirty pound dog. A special Search and Rescue dog who doesn’t search for lost people. She searches for lost pets, writes Glory's handler, Landa Coldiron. When she was eight weeks old, I picked her from a litter of several other Bloodhound puppies. 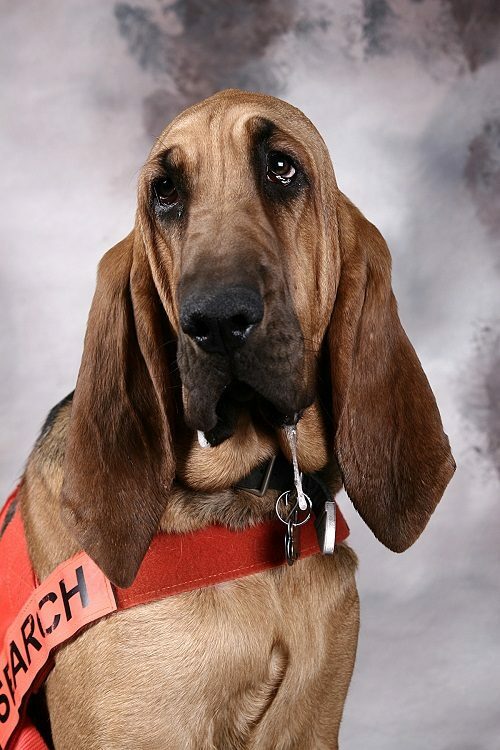 She would be my second Bloodhound which had been used to help locate lost pets. Why a Bloodhound? They’re big, they’re stubborn and need a job. Glory was bred to follow a scent trail. She’s an extreme example of a scent adapted hound and she’s a descendant of the oldest race of hounds that hunt by scent. Her pendulous ears, flews and dewlaps all work to bring scent into her nasal cavity. It’s said that Bloodhounds have two hundred and twenty million scent receptors, while humans have twenty. I started training her the first day I brought her home by doing puppy runaways. A runaway is the basis of all trailing dog training. Two people and a ‘target’ pet are required. As the handler, I held on to Glory while my business partner (with a friendly dog on leash) ran away from Glory calling to her in an excited voice. Even at the young age of eight weeks old, she was motivated to follow. She yipped and pulled on her harness and couldn’t wait to catch up to the other dog. This was a long-term game we utilized to train Glory. We would find different dogs for her to run after, and even place cats in carriers and run away with them. Glory was always eager to follow and receive her reward in the form of praise or a treat. Over a period of time, we lengthened then aged the trail and added turns. We also trained her on ‘negative’ scent, meaning ‘there is no scent here’. I’ll never forget Glory’s first lost pet case. She was eight months old. A white Persian kitty had been missing for three days in a residential/rural type area of Los Angeles. I gave Glory the cat’s scent by having her smell its bedding. She took off and led down a street, onto some lawns and came to the end of a long block. Locked on scent, she sniffed to the left and to the right. She decided on a direction of travel back to the left and then another left which led into an open field. Suddenly, her body language changed as she lowered her head and scented back and forth on the ground with her big nose. She stopped and directed her gaze to me. My business partner and I looked on the ground at what she had found. Tufts of white fur lay strewn across the field, indicating predator involvement. While it was a sad loss for the owners, it did provide closure so they did not have to keep looking and wondering what happened to their beloved pet. Glory had done her job…providing a correct direction of travel, targeting evidence and solving the case. Over the years, Glory’s had hundreds of finds in difficult terrain and varying degrees of temperatures. One case I like to highlight is Goldie, a Pekingese who had been missing for nine days. Goldie had been lost by a pet sitter who did not have permission to take her to his work over sixty miles away from where Goldie lived. The Pekingese darted and backed out of her collar. Goldie’s family was devastated. They put up hundreds of flyers, offered a several hundred dollar reward, called over a megaphone and searched for eight days with no sightings. Glory was their last hope and when we arrived on scene, it was raining. Glory took scent from Goldie’s collar and trailed around buildings and then to chain link fencing with holes big enough to climb through. Railroad tracks ran along the other side of the fence, but as Glory sniffed around the tracks, she gave me a negative scent indication and abruptly led across a street to an outdoor marble factory. Adamant about getting into this area, Glory waited while my partner obtained permission from the manager who said there was absolutely, 'No dog'. With permission granted, Glory continued to trail around a maze of large pallets. After a half hour, Glory slowed and started wagging her tail and dipped her nose to one particular pallet. My partner peeked under, and there was Goldie! We were able to coax her to us and she was reunited with her owner that day. She had lost one-third of her body weight and needed veterinary care, but she is alive and well today living in Idaho. When I saw the American Humane Association 2015 Hero Dog Contest, I knew I had to enter Glory. I needed a Charity Partner and the National Search Dog Alliance agreed to be my charity. The voting process was several months long with many dogs vying for the prestigious title. Other categories in the Hero Dog contest included: Emerging Hero, Arson, Military, Law Enforcement, Therapy, Service and Guide and Hearing. All in all, over two hundred incredible dogs had entered the annual contest. In August of 2015, the results were finally announced. Glory had won in her category of Search and Rescue with thousands and thousands of votes. Twenty-five hundred dollars would be donated to my Charity Partner. On September 19, 2015, Glory was presented her award at the Beverly Hilton International Ballroom by the American Humane Association and the Lois Pope LIFE Foundation, which was aired on The Hallmark Channel. She was also invited to a Congressional Briefing on America’s Hero Dogs in Washington, DC with the other seven Hero Dogs. I attended in her name as she was too big to be accommodated in coach travel by plane. Glory will continue to help people look for their lost pets. She specializes in finding cats and friendly toy breed dogs. Ten million pets go missing each year in the United States, leading to the overcrowding of shelters and needless suffering and euthanasia. I urge everyone to have legible ID tags on their pets at all times, along with a registered microchip. A microchip is not a GPS. Landa Coldiron owns Glory and Diana, two award winning Bloodhounds, and alongside her business partner runs www.lostpetdetection.com. Canine Degenerative Valve Disease: Has a New York Veterinarian Found a Cure?